One of the great opposers of Juan Manuel de Rosas & Nicolás Avellaneda is here… or maybe not. Born in 1817, Tejedor became politically active while studying law at the University of Buenos Aires. Firmly against authoritairan Rosas, he decided to ride the storm & remain in Buenos Aires while most of his friends went into exile. Forming the Club de los Cinco, Tejedor plotted against Rosas with ranchers in the southern province. If a revolution could hit Rosas where it hurt economically, then perhaps he could be removed from politics. Fat chance. The Maza Conspiracy failed, forcing Tejedor to flee to Chile. Returning to Buenos Aires after Rosas left for England, Tejedor was elected to Congress twice but resigned both times based on principle. He fought for the independence of Buenos Aires along with fellow intellectuals Valentín Alsina, Adolfo Alsina, José Marmol & Pastor Obligado. Representing Buenos Aires after the 1859 Battle of Cepeda, the city swore to the national consititution but did not hand over the big prize of port duties. In turn, this lead to the 1861 Battle of Pavón & yet another defeat for Buenos Aires. In 1878, Tejedor became governor of the Province of Buenos Aires & openly opposed President Nicolás Avellaneda. Although strongly supported, Tejedor failed to defeat Roca in the presidential elections of 1880. When Tejedor learned of Avellaneda’s plan to make Buenos Aires the national capital, he gathered forces to overthrow the current President & annul election results. Avellaneda fled to Belgrano (at that time not incorporated into the city limits of Buenos Aires) & left President-elect Roca in charge of the Army. After battles in Flores, Barracas, & Parque Patricios, Tejedor’s forces were defeated. Carlos Tejedor did not resign from politics & later wrote a book titled “La Defensa de Buenos Aires” about the 1880 insurrection. But here’s my beef. 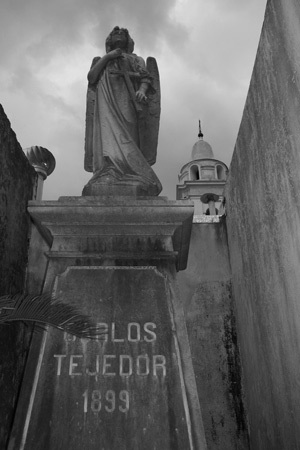 Historians claim Tejedor died in 1903. Everyone else says Tejedor is buried here. The gloomy 1899 tomb pictured above doesn’t make sense. Tejedor should have a larger tomb based on his importance in national affairs, or at least the dates should coincide. May be a cousin or sth like that. Porteño aristocratic families always used the same names repeatedly. Perhaps our Tejedor is in another place of the cemetery (may be a family vault? However, I doubt that he would get so much honors… he died during Roca’s second term, and he wasn’t exactly famous for his forgiveness! ps:I will really miss this blog when u leave. I love the historical gossip! It’s true, but I haven’t seen any other Tejedor buried there. Plus, all the other books about Recoleta Cemetery point to this tomb as the one… are they all wrong? That reminds me that Lavalle wasn’t buried there until after Rosas was kicked out by Urquiza. Funny. Hopefully I can maintain this blog some way when I’m in Australia. I’m taking 100s of photos every day I can in an attempt to have material to write about… even if I’m not in BsAs! Hello, I don’t speak English very well, for that reason I write to you in Spanish, it’s ok ?. I have read that You speak Spanish, so We will be understood, I hope. Buscando información sobre el “Cementerio de la Recoleta” he dado con tu página y me parece “estupenda”. Está muy bien realizada, las fotos son muy buenas y los comentarios adecuados. Ahora quisiera saber si la tienes escrita en “español”, pues sería de mucha ayuda para quienes busquen información o visiten tu página. De no tenerla podría ayudarte a traducirla “ad honorem” y asi poder contar con una versión española de la página. Espero tu respuesta y muchas gracias igualmente por esta página en inglés. Hola Ezequiel – Gracias por el comentario. Lamentablemente, no tengo una versión en castellano. Desde que empezamos el blog en octubre del año pasado, Marcelo y yo queriamos armar otro blog paralelo en castellano… pero sería un montón de laburo traducir todo. Si bien hay varios posts sin texto, voy por post #150! Igual, si te da la gana, acepto tu propuesta. Creo que entre los 3, podemos traducirlo bien. Dentro de 3 meses me voy a Australia a vivir asi que estoy a mil con la mudanza. Vamos viendo que podemos armar. Gracias y saludos! Ok, Robert, ponte en comunicación conmigo via mi mail y arreglamos sobre que “textos” quieres que traduzca, y si te va bien la traducción continuaríamos sin ningún compromiso, solo ayudar y ayudarnos. Just to add to the confusion, the statue of Tejedor located in Plaza Sicilia, gives his date of death as 1902!